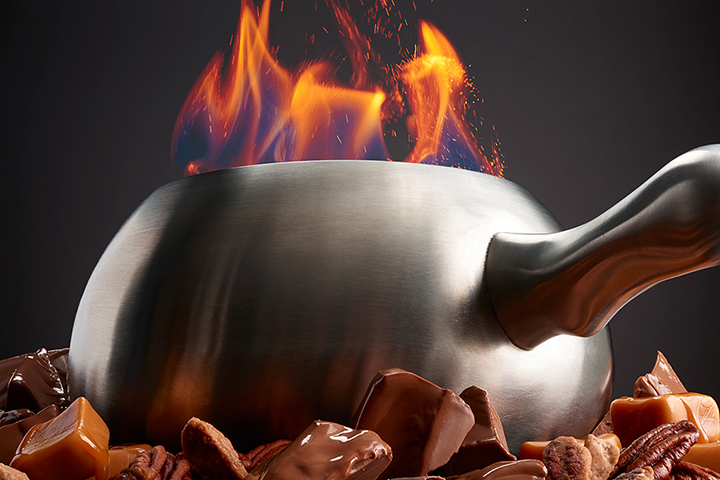 See what the fondue pot is cooking! The Grill Cooking Style is Here! **Price Does Not Include Tax or Gratuity & Cannot be combined with any other offer or discount. Join us in our bar daily for Happy Hour •$3 off Specialty Cocktails • $4 Mixed Drinks • $5 Select Craft Beers • $6 House Wines • $3-$6 Bar Bites *View Details* Some restrictions apply. Happy Hour and Happy Hour pricing is in our bar area only. There is limited seating and it's on a first come, first serve basis. Tables in the bar may be reserved for special event nights and will not be available for Happy Hour at all times. Happy Hour Promotion cannot be combined with any other offer or discount. Tax & Gratuity not included. Please Drink Responsibly. We are open for lunch every weekend! Full menu available. Do two courses or all four. The choice is yours! Lunch Specials include a three-course Power Lunch for $20.95 or our four-course Afternoon Delight for $31.95. Pay the Date is Back April 30th! We are offering our select 4-course menu for $30. Just our way of saying Thank You to all our loyal fondue fans. Reservations Required, please call 412-261-3477. Satisfy your late night cravings. Join us weekdays after 9p.m. and weekends after 10p.m. for cheese fondue, chocolate fondue and a bottle of our house wine for $44/couple. Join us for our NEW Ladies' Night Out every Thursday in May. Enjoy live music starting at 4pm while sipping on one of our hand crafted specialty cocktails or glasses of wine for $6 and enjoying any cheese, salad, and chocolate for just $21.95. Special Mother's Day Set Menu Details Coming Soon! Enjoy the full fondue experience Gluten Free or Vegan! We offer all of our courses Gluten Free including Gluten Free bread, and dessert dippers. We also offer Vegetarian & Vegan options. Please view our Gluten Free menu or call the restaurant with any specific questions. Enjoy the full fondue experience Gluten Free! We offer all of our courses Gluten Free including Gluten Free bread, and dessert dippers. Please view our Gluten Free menu or call the restaurant with any specific questions. We also offer Vegetarian options.